One of the first topics that I am usually asked about by a personal injury victim looking to hire a Pennsylvania motorcycle attorney is, “Who is going to pay for my last wages?”. Given that many people today are living paycheck to paycheck I understand just how devastating it can be to be laid up in the hospital or at home after motorcycle accidents; especially if your job is physical in nature and you’ve just been told that you must remain non-weight-bearing for 8 to 12 weeks and in some cases even longer! Call motorcycle attorney Lee Gaber at 888-292-5352 for a free consultation. Close to 80 percent of my clients have no private or employer sponsored disability policies. The lucky ones have some accumulated sick or vacation time, but the majority have no alternate source of income and in just a few weeks are falling behind on their mortgage, rent, or utility bills. In tough economic times, many Pennsylvania motorcycle accident victims immediately fall behind with their bills. Some were barely making it even before their motorcycle accidents. The stress can be nearly unbearable. Some immediate remedies available to me as a motorcycle accident lawyer to help keep a motorcycle accident client above water, such as borrowing money to stay afloat. However, I am not going to sugar coat the reality that in some circumstances, depending on how the motorcycle accident happened, the severity of the personal injuries, and even the identity of the other insurance company can play a role in how quickly I can recover your lost wages, or get your bike repaired. Call 888-292-5352 to discuss your specific case. Adding insult to injury, while Pennsylvania motorcycle attorneys can protect your rights, we cannot force insurance carriers to pay any part of your lost wages from a motorcycle accident until they decide they are ready to resolve your entire motorcycle accident claim. Depending on your injury, your motorcycle attorney can recover your lost wages in as little as 3 months or as much as two years, depending on your claim. Do You Recommend I Return to Work? 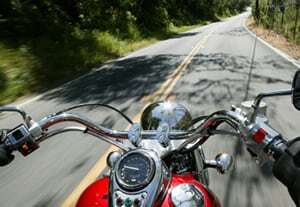 Many Pennsylvania motorcycle accident victims have convinced their doctors to allow them to go back to their old jobs, because if they don’t return they will be fired. This is never an ideal situation, but when forced with the possible loss of their home, many motorcycle accident victims feel it is necessary to get back to work as soon as they are able. Although I have had some clients go back to work before they were ready to do so, I advise that if they need to get back to work and are able to do so, they should not put their motorcycle accident case ahead of their ability to earn a paycheck. We will ultimately recover your lost wages from your motorcycle accident. Remember, most insurance carriers will only pay the lost wages as part of a global motorcycle accident settlement in Pennsylvania, that includes not only lost wages but also medical bills reimbursement, and pain and suffering as well. In the end if you simply cannot return to your former employment and are forced to take a lesser paying job, we will also make a claim for loss of earning capacity. My job as your motorcycle accident attorney in your motorcycle accident claim will include the hiring of a vocational economist, as required; we are always prepared to hire the best and brightest experts to insure that our motorcycle accident clients receive every penny they are entitled to. Just like with motorcycle injury medical bills, if you have an option to purchase some sort of income protection through either your employer or your insurance carrier, I advise you to do so. Losing the ability to earn a living is often one of the most devastating consequences of being involved in a motorcycle accident in PA.
Fortunately, when you hire a good motorcycle attorney from a reputable motorcycle accident law firm like mine you are in great hands. So don’t hesitate to contact Pennsylvania motorcycle accident attorney Lee D. Gaber, Esq. – you are never charged for a consultation until we win your case!